*Families with young birders (13 and older) and groups of 3-4 friends may receive a discount for triple or quad occupancy. Contact us for details. Panama possesses incredible biodiversity sheltered in thousands of acres of protected forest, easily accessible due to excellent infrastructure. Panama has MORE BIRD SPECIES than all of the United States and Canada combined and MORE BIRD SPECIES than its neighbor to the west, Costa Rica! Come with us and see why Panama is a birder's dream destination! Upon our arrival at the Tocumen International Airport, we will be transferred to Soberania Field Station and Lodge in Gamboa. Most flights arrive in the evening, but if you arrive earlier in the day, you will have time to relax in the open-air dining area of our lodge where you can become acquainted with the many species of birds that frequent the feeders. We will visit birding sites near the field station in Gamboa. Over 190 species have been seen just in the yard of the field station! Other nearby sites we will visit include the Ammo Dump Ponds (where we might see White-throated Crake), the banks of the Chagres River, and the entrance to the famous Pipeline Road. Some of the bird species we expect to see in the gardens of the lodge include Red-legged and Green Honeycreepers; Blue-crowned Motmot; Crimson-backed, Blue-gray, and Palm Tanagers; Gray-headed Chachalaca; White-necked Jacobin and Rufous-tailed Hummingbird. Expect to see Agoutis beneath the feeders, and watch for Geoffrey's Tamarin in the trees near the patio where we have our meals. Near the lodge, we usually see Keel-billed and Chestnut-mandibled Toucans, and often sight a Bat Falcon near a nest tree. At the Ammo Dump Ponds, in addition to the elusive White-throated Crake, which is almost always heard but rarely seen, we might find Rufescent Tiger-Heron and other wading birds. Along the Chagres River, we will look for passerines as well as wading birds, shore birds, and raptors. We might find Capybara foraging among the lily pads with Purple Gallinule and Common Moorhen. Expect your first day's list to be chock-full of lifers! We will have the opportunity to hike along the world famous Pipeline Road at the Soberanía National Park. With just over 48,287 acres, this park boasts outstanding biodiversity, including most of the 500 species of birds recorded for the Panama Canal area. Frequently you can come across a mixed-species foraging flock containing literally dozens of different birds like Dot-winged and White-flanked Antwrens, Fasciated and Western-slaty Antshrikes, Plain Xenops, Olivaceous Flatbill, Black-tailed Flycatcher, Cocoa Woodcreeper, and many more. This area is also famous for the occurrence of Army Ant swarms who, by raiding the forest floor, flush out many insects that in turn attract a series of properly named Antbirds. Possible are Spotted, Bicolored, and Ocellated Antbirds, along with many Woodcreepers including Northern-barred, Plain-brown, and Black-striped. In addition, you may come across a Gray-headed Tanager, or an opportunistic White-whiskered Puffbird, or even an elusive Streak-chested Antpitta. Depending on tides and other variables, we might decide to drive into Panama City to observe shorebirds at the world-renowned mudflats. Because this visit must be timed not only for the best conditions with tides but also take into account the traffic we might encounter in the city, both groups will go at the same time, but will divide and visit different areas to maintain the 8:1 birder:guide ratio. If a visit to the mudflats is not possible, we will return to explore further on Pipeline Road, where we will be on the lookout for interesting inhabitants of the lowland rainforests including Black-chested Jays, Black-breasted Puffbirds, Purple-throated Fruitcrows, among many others. In addition, we will also search the skies above for raptors like White Hawk, Bat Falcon, Black Hawk-Eagle, and perhaps even a majestic King Vulture. Some rarities are possible here, including the elusive Pheasant Cuckoo. We will visit Summit Ponds and walk along Old Gamboa Road. At Summit Ponds, we should see multiple species of Kingfisher and Boat-billed Heron. If we're exceptionally lucky, we may catch a glimpse of a Capped Heron. Along Old Gamboa Road, we hope to find a pair of Spectacled Owls that have been present in this area for many years. Other sought-after species that are possible include Lance-tailed Manakin and Black Hawk-Eagle. Summit Park On one afternoon, we will visit Summit Park where we will enjoy an exhibit featuring a Harpy Eagle. We will learn about this raptor and see a Harpy Eagle in captivity. As a bonus, the grounds of the park are good for many common (and some not-so-common) species. After an early drive this morning, we will be birding the foothills of the Chagres National Park. With over 320,000 acres, this is the largest protected area in the Panama Canal Watershed. Here we can find humid forest species like Rufous-crested Coquette, Bronze-tailed Plumeleteer, White-tipped Sicklebill, and even the endemic Stripe-cheeked Woodpecker. 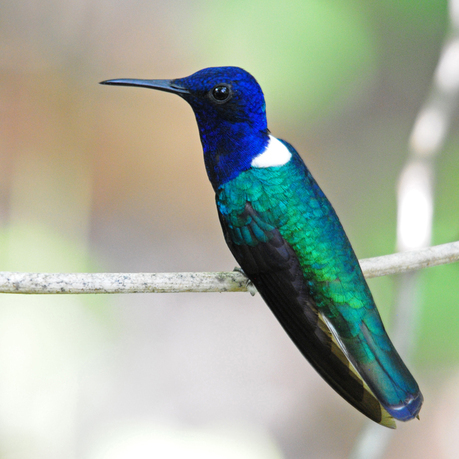 Time-permitting, we may visit the house of some of Panama Audubon members in the area who keep bird feeders with dozens of hummingbirds species attending, including Green Hermit, Snowy-bellied Hummingbird, Violet-headed Hummingbird and the nearly endemic Violet-capped Hummingbird. Fruiting trees in their backyards may also prove interesting with multiple tanagers, as well as Green, Red-legged, and Shining Honeycreepers. We will continue driving to the east to a small town called Torti, where we will check in to the Hotel Avicar for the night, positioning ourselves to bird the nearby San Francisco Reserve early the next morning. Our overnight stay in Torti will afford us the luxury of birding San Francisco Reserve and the Bayano Valley without the very early (4:30 AM!) departure that was once required to be on site by 7:00 AM. Bayano Valley is an important birding locale because it represents the western-most limit of the range of many Darien endemic and specialty birds. The habitat in the valley consists of forests that protect the Bayano River watershed, riverine woodlands, scrub, and open savanna. Birding can be done by road and along several trails within the valley. A reservoir within the valley provides habitat for a variety of aquatic birds and is nearly the northern-most limit of the range for Cocoi Heron. The most notable target species is the Black Antshrike, whose range is limited to Darien Province of eastern Panama and adjoining northern Columbia. Other species of special interest that can be seen in the valley include Gray-cheeked Nunlet, Rufous-winged Antwren, Green Manakin, White-eared Conebill, Golden-Green Woodpecker, Rufous-winged Antwren, One-colored Becard, and Orange-crowned Oriole. Early one morning we will visit the Rainforest Discovery Center where we will enjoy viewing canopy species from a tower that stands 100 feet above the forest floor. From here, we have had stunning looks at Blue Cotinga, Black-mandibled and Keel-billed Tourcans, Gray-headed Kite, Scaled Pigeon, Squirrel Cuckoo, Cinnamon Woodpeckers, and many others. Miraflores Locks On the final day of the tour, we'll return to the lodge for lunch and a short midday siesta after a full morning of birding, and then we will visit the Miraflores Locks of the Panama Canal. Here we can view a short video, tour the museum, and watch ships as they move through the locks. For the grand finale of the tour, we will enjoy a scrumtious buffet dinner in the Miraflores Locks Restaurant overlooking the Panama Canal. We can watch ships as they go through the locks in the moonlight as we enjoy what is rated as one of the best dining experiences in Panama. After dinner we will be transported back to our lodge to prepare for our departure the following day. You will be transferred to Tocumen International Airport for your international flight, scheduled at a time that is convenient for your flight schedule. due to unforeseeable circumstances such as weather, landslides, and other natural phenomena, as well as suggestions by local guides in order to take advantage of an unusual birding opportunity. Lodging is subject to change based on availability. ~ Donation to the conservation efforts of the Panama Audubon Society. ~ Expenses of a personal nature such as laundry, phone calls, extra drinks and snacks, etc. Deposit of $350 with registration (registration form is at the end of this flyer). Balance is due on or before Feb. 20, 2015. If cancellation occurs after full payment is made, a refund will be given only if the vacant spot is filled.